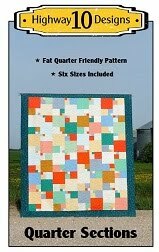 This is Rae’s Vintage Kansas City Star quilt which is a block of the month project from the Fat Quarter shop. You can buy this BOM project here. Rae’s only request was that there be no feathers in the outer border so I did a Bead Board design which compliments the feather motif in the light sashing areas. I made a stencil with a simple loop design to use in the corner stone blocks and framed it with a 1/4” line to match the bead board. 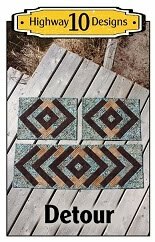 Each block is quilted with a different design using feathers, CC, straight lines, etc. I stippled all the light background fabrics to compliment the texture of the feathers in the sashing. It’s hard to capture the quilting on the back in a picture but it really shows up nicely in person! If you look closely you can see a large pile of snow on the ice, my son and I are building a quinzee. If you don’t know what a quinzee is check out this link. We still have to hollow out the inside this weekend. Here is the next block for the Curve it Up Quilt Along, its the Dresden Plate. You can find the instructions for this one on Jenny’s blog here. I now have 9 blocks done and really like how this quilt is coming together. I am getting short on my hand dyed background fabric so hope I have enough to finish this quilt. Don’t think I can dye the exact same color shade again! I also received a package in the mail containing these lovely Bali Snaps! 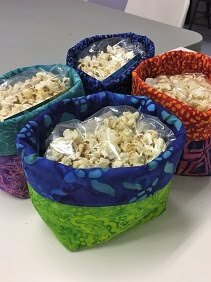 I had won a guessing contest on Linda’s blog, the second one I have won on her blog! I guess I’m a good guesser! She send me a gift certificate for an online fabric shop and I had no problem finding some lovely batiks. Thank you Linda, that was so sweet of you!! I have been busy working on a beautiful Sampler quilt this week and will be sharing that soon! This is Valery’s Oak Leaf quilt and it looks great among the evergreen trees! 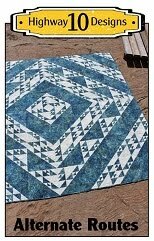 I know this is a Quiltmaker pattern but I couldn’t find the issue number. I quilted it using the panto Fascination and used Quilters Dream Blend batting. ..made by this big kid! This is Evelyn’s Island Sunrise and she used two set of patterns to make her quilt larger than the wall-hanging size we made at the guilds workshop. The green and blue batik fabrics make for a wonderful colour combination. She asked for an edge to edge quilting design and I chose the Curlz panto. So Fine green thread on top and blue Bottom Line for the backing. I just snow dyed this backing for another Island Sunrise quilt that I will be putting on my machine next. I’m really enjoying this side to my business, dyeing backing for my clients quilts. 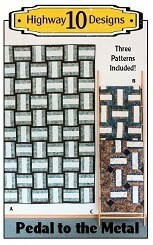 I know not all quilts look good with a snow dyed backing as they are very bold pieces of fabric but they seem to suit Judy Niemeyer quilts because of the high contrast of light and dark fabrics on the top. For this backing I mixed two different concentrations of Marine blue and a small amount of a green and poured the liquid dyes onto the snow. Here is a peak of the quilt it is for. This is Val’s Island Sunrise quilt that she made at our guild’s Judy Neimeyer workshop in the fall. Love the combination of blue and browns in the batik fabrics she chose. 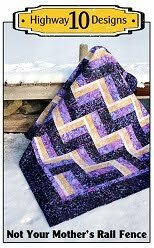 I used the panto called Mimosa, Lava thread and Quilters Dream Blend batting. We have had more snow and blowing snow so after I filled my boots up with snow taking these pictures along the shoreline I marched over to the rink to find my path yet gain filled in! I’m really getting my shoveling skills perfected this winter! Val brought a lovely brown batik fabric for the backing.